Video may have killed the radio star, but the increasing number of daily, weekly and bi-weekly newsletters out there are certainly keeping e-mail alive and well. It seems like every outlet and influencer has a new newsletter available every day. On one side, as PR pros, each newsletter can feel like one more thing to keep track of when it comes to your clients and brands. On the other side, it also presents new opportunities to find possible placements, stay keen to what’s being discussed across industries, the markets and society at large. For example, one of my former clients was in the fast-casual dining space and was relevant across corporate, financial, foodie, mom, fitness and pop culture outlets. It turned out that newsletters were a really great way to read what’s happening with competitors, the industry and general news in one foul swoop. Some were really niche, while others were as common as theSkimm. Throughout this monitoring experience, I also subscribed to several newsletters just for fun, which have come in handy during networking events and helped me in my personal life outside the office. It’s hard to sift through the amount of content available to us every day and week, but these have added value, whether at the office, for my professional development, or my personal benefit. Consider which outlets would be helpful and beneficial for you, your clients and your team. Pro tip: I have a rule set in Microsoft Outlook to automatically filter newsletters into a specific folder so my inbox itself is free and I can find/skim the newsletters in one place. If you aren’t using Outlook, you can also use Unroll.me to receive all of your newsletters/subscriptions in one email instead of ~20. What newsletters are your go-tos? Let us know! 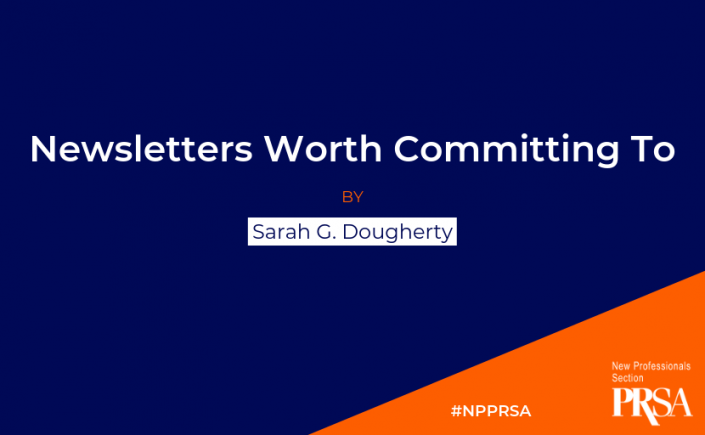 Sarah G. Dougherty is a member of PRSA and PRSA New York. Following a stint on the agency side, she is on the external communications team at a Fortune 100 company. Sarah is a former member of the PRSSA National Committee and a graduate of The University of Alabama. Follow her on Twitter @sarahgdougherty. A great way to get involved with your local chapter is to join the board. This allows you to plan the best year yet for the local chapter. Whether you want to be the historian or happy hour coordinator (like me), you are in a space where you can contribute ideas on programming and network closely with like-minded individuals. If you’re not ready to be a board member yet, volunteering is a great way to start getting involved. There are fundraising events, award ceremonies and networking mixers that need planning and support. Contact your local chapter to see how you can play a part. PRSA is a great way to enrich your professional life through networking and career development. 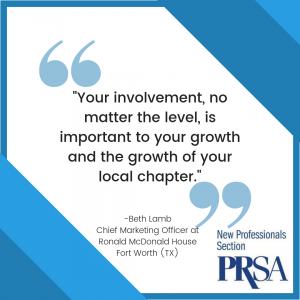 “Plus, your involvement, no matter the level, is important to your growth and the growth of your local chapter,” said Lamb. 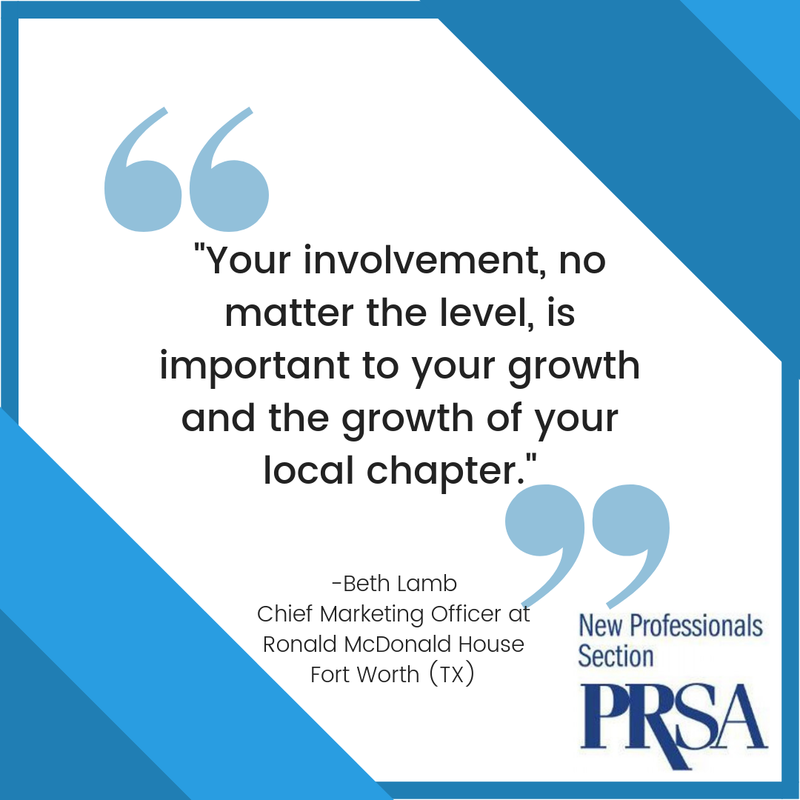 Find your local chapter today at PRSA. Jade Fails is a Baylor University public relations graduate. She is currently the Marketing Administrator at The Shops at Clearfork in Fort Worth, TX.